Five skiers, a French guide and four Swiss clients have been killed in a serious avalanche in the North of Norway on Monday. A Swiss national was recovered alive from the slide. The skiers were part of a group of 12 skiers accompanied by two French guides. 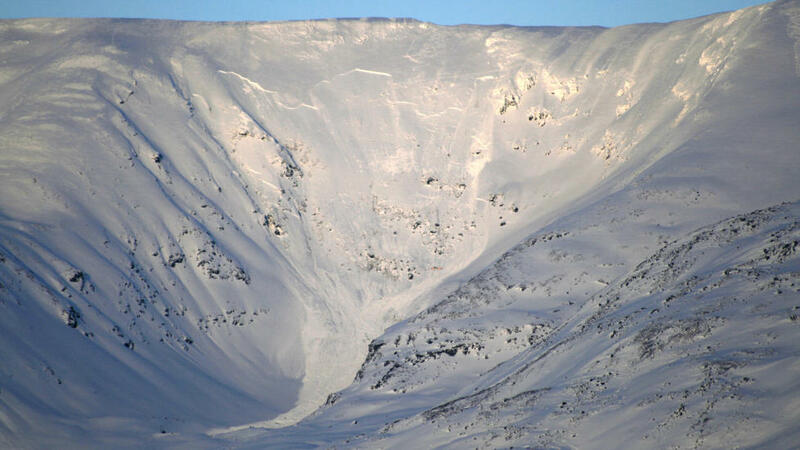 The avalanche occurred in the early afternoon at around 1000 meters altitude on the 1288m Sorbmegaisa in the Kaafjord area around 120km/h east of Tromsoe. The slide was 8 meters deep in places. 30 rescue workers and avalanche dogs were attended the scene and they were assisted by F16 fighters deployed by the Norwegian airforce as air reconnaissance. The guide was named as Jérôme Morachioli who worked for the Mont Blanc area rescue services. Dr Morachioli was very well known, originally from the Isere department and guide since 2005, he had participated in hundreds of rescue missions. The second guide, a member of the PGHM in Annecy, gave the alert. The Franco-Swiss team of 2 guides and 10 doctors from the Geneva region were on a sailboat tour of the Fjords and mountains. The avalanche risk was 3/5 and the slope around 35 degrees. The rescue services took an hour to arrive in the remote location. All the skiers were equipped with ABS and beacons. It is the most serious avalanche in Norway since 1986. Appartently the name Sorbmegaisa is Lapon for “very dangerous mountain”. All the skiers were equipped with ABS and beacons. Do you have any information if the ABS were deployed during the avalanche? Press reports say at least two bags were deployed. I assume the police gave them this information. A reminder, as with the big les Arcs avalanche last season, that ABS have some limits. Accident at Sorbmegaise landslide in Alta, where five people died and one survived, was inspected by police, Norwegian People’s Aid and NGI Wednesday 21 March. This is a preliminary description and assessment of some points, after representatives of the police, the Norwegian People’s Aid and NGI Wednesday 21 March inspected the area in the mountains Sorbmegaisa in Djupvik in Alta municipality, where the fatal avalanche occurred on Monday 19 March this year. Comprehensive report with photos and video will come later. First, finding places at the bottom of the landslide mapped. The 6 people who were taken by the landslide was dispersed by 530 m between the highest and lowest finds place (between contour 674 and 832). The landslide was 50-200 m wide at the site. Measurements showed that the 4 lying at the bottom of the avalanche was buried 3.6 m deep. The two that were far up in the avalanche were buried so deep, and one of them survived. The avalanche went far past the place and down on a lake where it broke the ice and a mixture of snow and water went any further. Avalanche stopped at ca. contour 600 and walked about 570 meters. Discharge angle was 21.6 degrees. The avalanche was estimated 2 km. After studies at the bottom of the avalanche was the study group brought to the top of the mountain by helicopter. Stian Edvardsen Kvalsvik (Norwegian People’s Aid) and Kjetil Lien Bratt (NGI) abseil down to one violation of the edge 1170 m (100 m below the top). Fracture edge was here 2 m high and 36 degrees steep terrain. Subsequently, several breaches edges investigated. The landslide was triggered when a faint and quite loose layer of crystals cup went to break. This layer was about. 5 cm thick and lay between two hard layer. This is a persistent weak layer that the inspection was loose and unstable. Ski tracks of the group that was taken by the landslide was a traverse to the left (seen from below) just above the 2 m high fracture edge. Ski tracks was 200 m further to the ski tracks to 2 of the skredtatte disappeared when a new breach of border. Fracture edge at this point was only 10 cm thick, but increased rapidly in thickness to ca. 1.5 m Terrenghelningen was here 32 degrees. Bruddforplantningen may have started here and given the avalanche 200-400 m to each side for about the same height level. There are an estimated 20 separate violations edges that are not contiguous in the mountain. Bruddforplantningen meant that the avalanche was very large. It is believed that those who were taken by the landslide were scattered over the mountainside when the avalanche released. One of the victims had avalanche bag (airbag). He was found near the bottom of the avalanche of 6 m depth was significantly deeper buried than the other. Thanks for keeping us updated. So a layer of 5cm of depth hoar (cupped crystals) with a 2 meter slab on top. However the fracture actually started on a 10cm layer and propagated from here. Note only one skier was wearing an airbag and he was the deepest buried (6 meters) so we can probably rule out airbags as a factor in the decision making. I never normally post or reply to topics but felt that I had to for this. Myself and 6 friends skied that very bowl the same week last year, although a more southerly line. The loading this season looks considerably different but it is a very sobering thought none the less. Do you know if the 2nd group were about to ski the same line or had they decided to go elsewhere and if so, for what reason ? Did anyone have any hunches or gut feelings that it didn’t feel right to be there as is often the case ? Condolences to all involved and their families. Our route down there last season makes me shiver when I look at it now !